Giving feels good – so good that we have devoted an entire holiday to it. But as warm and fuzzy as it makes you feel when you find the perfect gift for everyone on your Christmas list, there is nothing quite as meaningful as finding a gift that gives back in an even bigger way. So, we’ve put together a list of gifts that will not only be loved by whoever you are buying for but will also provide vital resources, funding and help to those in need. Because – get ready to cringe – isn’t that what Christmas is all about? Take the legwork out of your Christmas shopping by checking out the Real Homes team's top 50 Christmas gifts for 2018: we want them (and so will you and your friends and family). Yep, you read that right. Oxfam Charity Gifts help fight poverty around the world by providing families with goats, pigs and chickens to help them get started. They also provide training to help people grow more crops, raise more animals and earn more income. Looking for the perfect gift for a foodie? 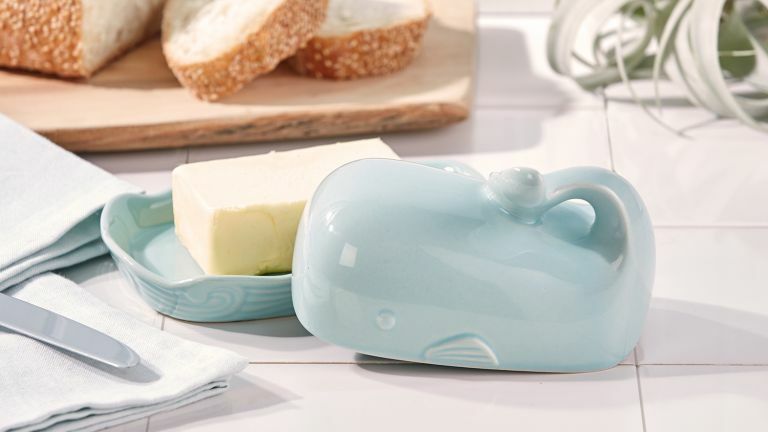 Look no further than this adorable whale butter dish. Bonus: any profits from products bought through the RNLI online shop go to the charity, and they have some surprisingly lovely homeware if you want to do some guilt free Christmas shopping for yourself! Trying to find the perfect eco-friendly Christmas gift? Well this Jerry water bottle won’t just help save the planet by reducing single use plastics, 100 per cent of the profits will also fund water projects in India and Tanzania and campaign for a reusable and sustainable economy. Ah look, just another kid’s Christmas gift in the shape of a unicorn. But we promise this one is different. This crocheted unicorn is made by Pebble, a company that strives to help women in India have a better life, by offering them fairly paid, good quality and flexible employment. More gifts for girls and boys can be found in our gift guides. This gorgeous smelling, super hydrating body lotion does wonders, and not just for your skin. With every purchase of Charity Pot, Lush donates 100 per cent of the price to small, grassroots organisations so they continue with their awesome work. Find more beauty gifts in our buying guide. The Toms ‘One for One’ scheme is probably as well known as its super stylish slip ons. With every pair of shoes bought, the company not only donate a pair of shoes to a child in need but help provide water, eye care and safe birth services for communities all over the world. Everyone loves a Christmas candle, so why not treat someone to a candle that also helps conserve those all important bees. Beefayre is vegan-friendly and Peta-certified, plus they donate three per cent of profits towards bee conservation and research, making it one of the best choices if you are after a cruelty free candle. Not only do they produce award winning teas that taste beautiful, Tea People is also a social enterprise that sends 50 per cent of their profits to education projects in tea growing regions. Soap co. is a luxury skincare brand that is good and does good. All profits are reinvested into employing, training and supporting people with disabilities to build skills, confidence and independence. One bottle of hand wash sold creates one hour of employment, with a bath or body oil creating two hours. Soap Co. currently employ more than 114 people across the country. To celebrate our 3rd birthday we have launched our Eco and Bee friendly collection in the beautiful stores of @theconranshopofficial. Their considered design-led shops feature products that aim to inspire and excite and now include award-winning ethical luxury as well. Find us in their Marylebone, Selfridges on Oxford Street, and Chelsea stores.⠀⠀⠀⠀⠀⠀⠀⠀⠀ •⠀⠀⠀⠀⠀⠀⠀⠀⠀ •⠀⠀⠀⠀⠀⠀⠀⠀⠀ •⠀⠀⠀⠀⠀⠀⠀⠀⠀ •⠀⠀⠀⠀⠀⠀⠀⠀⠀ •⠀⠀⠀⠀⠀⠀⠀⠀⠀ #excitingnews #ethicalluxury #socent #ethicalluxury #lux #ethicalbusiness #eco #luxury #shapedbyconran #theconranshop #beefriendly #launch #bees #consciousshopping #london #lovelondon #businessforgood #productlaunch #birthday #happybirthday #lifestyle #sustainabledesign #designedforgood #ecobeauty #rose #bethechange #pureingredients #newstore #designled The Soap Co.
Change Please coffee doesn’t just taste great (it’s all ethically sourced using the highest quality beans to achieve the perfect flavour) but the company also reinvests all of their profits to help people out of homelessness. Change Please also helps find jobs for homeless people by training them to be baristas. Looking for the perfect Christmas gift for a girl (or boy) that gives something back?B&Q have teamed up with Shelter this Christmas to raise money for families facing homelessness. For every one of these adorable fairies sold, B&Q will donate a minimum of £2 to support the charity’s frontline advice and support services. Oh and did we mention, she sings? Looking for the perfect gift for a foodie? The Heartfelt healthy recipe book was written by Pippa Middleton in collaboration with The British Heart Foundation. It includes hundreds of delicious recipe ideas for breakfasts, family meals, romantic dinners and parties as well as lots of advice for eating a more heart friendly diet. Better still, 100 per cent of the profits go to the BHF to fund life saving research. Buying a Christmas gift for a pet lover? This treat tin from the Dogs Trust doesn't just look cute, by buying it you will be helping save the lives of thousands of stray and abandoned doggies. There’s so much more to this soap than a brightening zing of Brazilian orange oil and earthy patchouli. Behind the palm-free soap base of extra virgin coconut oil and a solidifying mix, there lies a fight to give the forest back to Sumatran orangutans. Every penny from Orangutan soap (apart from VAT) will go to SOS, so it can buy another piece of 50 hectare forest for orangutans, and together with its partners on the ground, The Orangutan Information Centre, rebuild the home humans have taken. Designed in collaboration with Katherine Hamnett (a super cool designer who is all about sustainable fashion) and the Help Refugees charity these Choose Love t-shirts help raise funds and awareness for people caught up in the refugee crisis. Not only is this bedding from Rise&Fall sustainable and uses no plastic packaging, it also donates £3 for every sale of their bedding sets to Centrepoint, a charity that helps young homeless people. Annnd on top of all that, their factory's employees and their families have access to free education plus their factory runs on 100 per cent green energy. Get this on your Christmas list for a home lover in your life right now! Looking for more Christmas gift inspiration?